Tender Annual Heirloom. This French heirloom is possibly the ultimate pumpkin. Delicious flavor (some even serve raw, thin wedges), deeply ribbed form, and sumptuous buff color on 20 lb. fruits. Firm flesh is a rich shade of orange, and the pumpkin is named for its musky perfume. Hails from Provence in the South of France. Soil and Water: Pumpkins prefer loam or sandy soil high in organic matter to hold large amounts of moisture. The plants require heavy and even water for best development. Preferred soil pH is between 6.0-7.0. Planting and Growing: Start seeds indoors 3-4 weeks before the last frost or sow seed directly when soil temperature reaches 70°F. To begin growing earlier, use mulching plastics and row covers to warm the soil. Harvesting and Storage: For immediate use, harvest when the skin loses its sheen. For storage, harvest pumpkins when fully mature. Cut the fruit from the vine, leaving 4″-6″ of stem. Cure for storage by setting in a warm, dry location for 1-2 weeks. Did You Know? 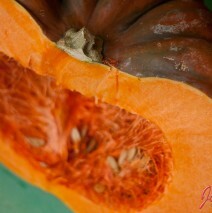 The seed cavity of this pumpkin is small, giving you lots of flesh per fruit.